It was great fun to attend the tenth anniversary of EAT! 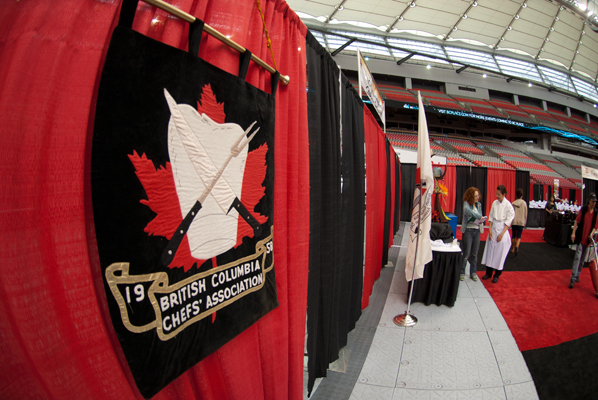 Vancouver, the Everything Food + Cooking Festival, this past weekend, at BC place stadium. 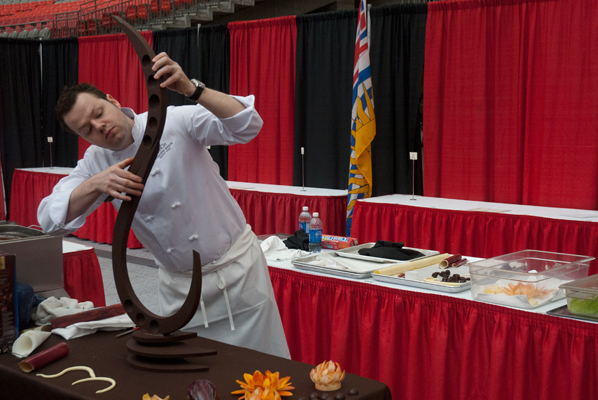 I was there with my intrepid photographer partner, to check out the BC Chefs Association Chocolate Competition, open to culinary professionals, bakers, pastry chefs and advanced students. We arrived on Friday afternoon, just as the festival was getting underway, and had the opportunity to get the “lay of the land” as the exhibitors put the last minute touches on their booths. Soon, a delicious aroma of espresso wafted over us as the barista competition got under way, and we were hailed by the “Grill It” man, who was tossing a sizzling array of vegetables on his indoor grille. We passed salsas and pistachios, salmon, bannock and fudge – everything from Thai fruit carvings to gourmet Pet foods and health products. We also passed several chocolate related booths, whose location I put in my internal GPS for later attention, as we made our way to the back wall of the exhibition, and the distinctive Chef’s Association sign. I love watching skilled people at work with chocolate. I find it relaxing, as they deftly handle this tricky and temperamental stuff. And as we walk up to the competition area, we have the great pleasure of meeting Hitomi Syvertsen, a pastry cook at Pan Pacific Hotel. 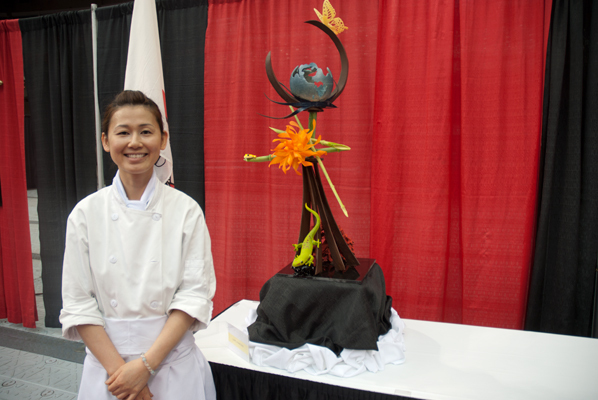 Hitomi and her two friends had just finished assembling her entry for the professional category, Chocolate Showpiece, entitled “Love of Nature”. She was good enough to chat with me, and tell me a little bit about her piece. Hitomi and her friends look remarkably calm, but as she tells it, the journey to the exhibition was anything but. They kept a close scrutiny on the road and route for any approaching corners and speed bumps. All of the elements for the sculpture were packed carefully, with plenty of “spare parts”. She has been watching the weather forecasts for a week, in case of temperature spikes (June in Vancouver can go from monsoon-ing to hot and sunny in about an hour), which would mean having to take extra care with keeping all the components cool, but since we have not seen a trace of sun for weeks, the cool, showery weather proved to be an asset for moving and keeping the chocolate pieces. Hitomi told me she came up with the original design with help from her seven year old son, who was enormously helpful with advice regarding exactly which animals should be represented in the final piece, what was missing, and if their colours needed tweaking. 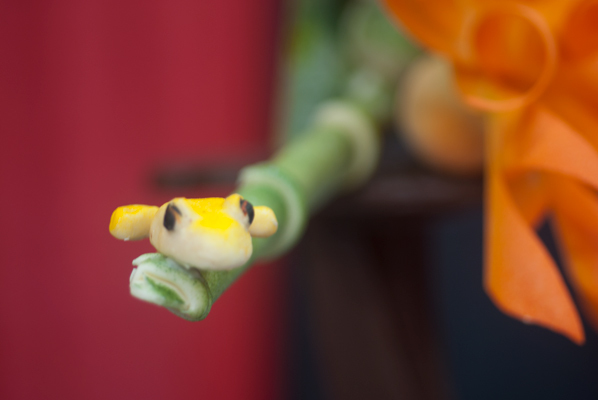 I am sure he approves of the bright yellows and greens of the gecko and Poison Arrow Frog, holding pride of place in the final showpiece. 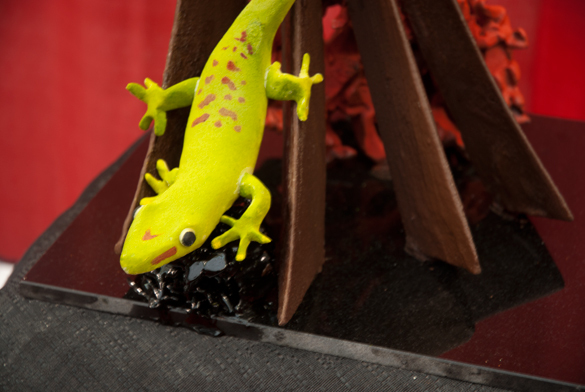 It took her approximately one month of practicing and testing the various components, to come up with the composition shown here, featuring the gecko, poison arrow frog, and butterfly delicately perched atop a bamboo sheaf, with burnt sugar “lava” and bright red “magma” bursting from underneath and supporting the whole. After 2 ½ hours assembling her creation here today, at the show, she looks serene and unflappable – qualities that I am sure she brings to her work in the busy pastry kitchen at the Pan Pacific hotel. She likes the pace in the pastry kitchen, which involves being highly organized, and since everything has to be prepared ahead of time, allows you to go at a steady methodical pace through the “slam” of a busy lunch or dinner service. All the creation happens before the rush starts. When I mention this to Chef Christophe Bonzon, pastry chef at CinCin, who has agreed to give the critiques and awards for the competition, he smiles and echoes Hitomi’s remarks. Chef Christophe was kind enough to allow me to ask him some questions while he created a beautiful chocolate sculpture over the course of the next four hours (he actually created two: one that day, and then again on Saturday) before heading off to his shift at CinCin! 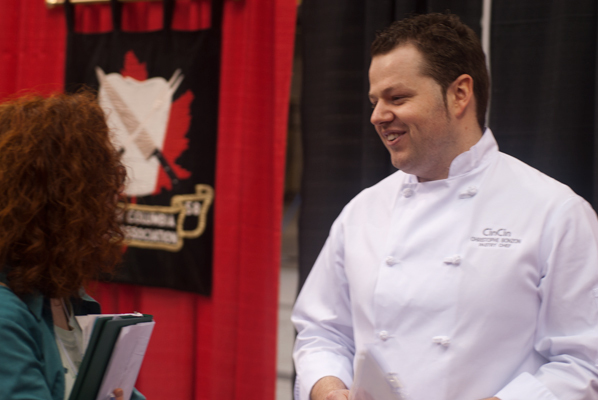 While Christophe is working, we visit some of the other exhibitors and I have the opportunity to meet Carly and her partner Daniel, of Kitchening & Co. by Carly Wintschel. Carly’s macarons are beautiful to look at, contain absolutely no artificial ingredients (for example, her pink tinted macarons are coloured with beet juice), have been getting great reviews, and as they are a new local business, I look forward, at a more leisurely opportunity, to speaking to her in depth about her company and this most challenging of pastries. Apparently she was so skilled at making macarons in the pastry course she attended in Paris, that the instructors asked her to teach her fellow students the technique. We cruise past the Green and Black’s Chocolate booth, but the line around it is four ravenous people deep, so I crouch down, snake my hand between a few folks, and scoop a tiny sample of my favorite of their line – the ginger dark. 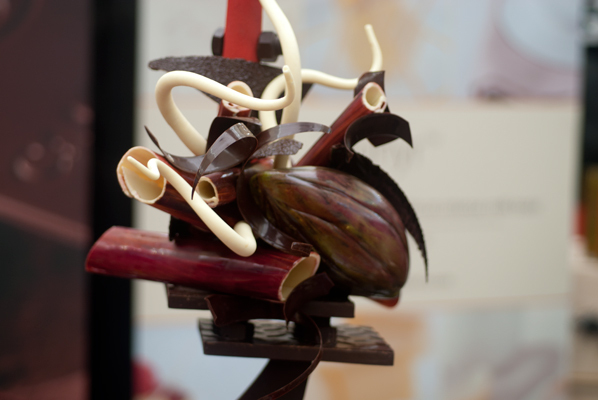 A few aisles over is Cacao Barry/Barry Callebaut at the Gourmet Warehouse table, where more delicious chocolate samples can be had, as we make out way back to where Chef Christophe is putting the finishing touches on his sculpture. 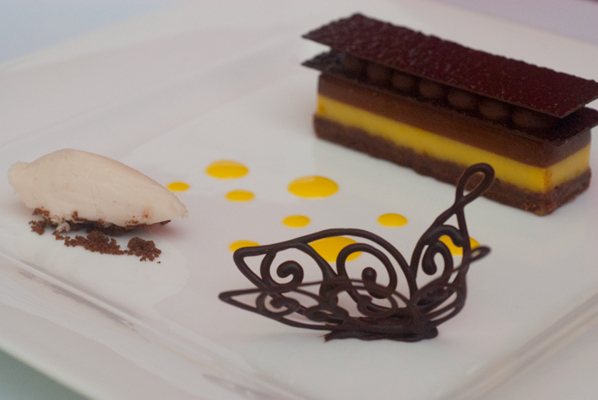 He has also taken the time to award the prize for the student category for plated desserts. 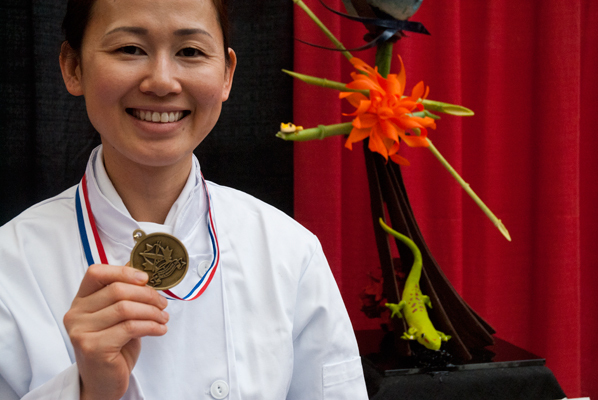 We stop to congratulate Hitomi on her medal for her showpiece, and turn to what had previously been a slab of chocolate and a pile of chocolate bits. As I watch Chef Christophe place two gracefully curved elongated “S”s of dark chocolate together, where they magically balance and hold, he tells me he employs long, stretched rubber bands to create the curves, and hold them in place while drying. 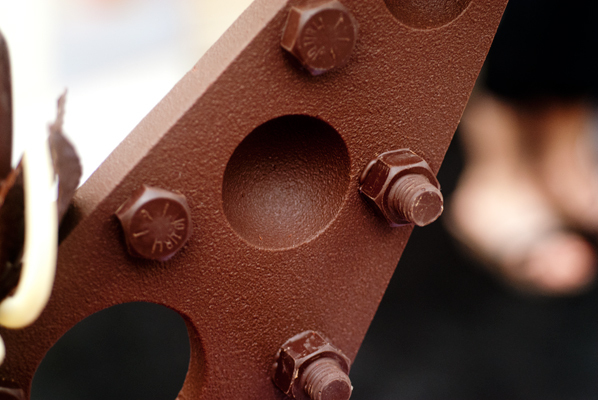 This sculpture also features chocolate bolts, for which he created temporary molds, using gelatin. He does mention that he only uses the gelatin molds for elements of sculptures, not candies or bonbons, but I think this is something I must have a go at, in future. I wish we could run all the photos together, or that I had had the presence of mind to bring a film camera, because watching Christophe in action is poetry in motion, as he ponders a spot, places a chocolate flower here with an assured touch, or a curlicue of white chocolate there. His finished sculpture is a thing of beauty. It has been a great pleasure to watch these skillful chocolate artists at work, and their patience and professionalism has inspired me. 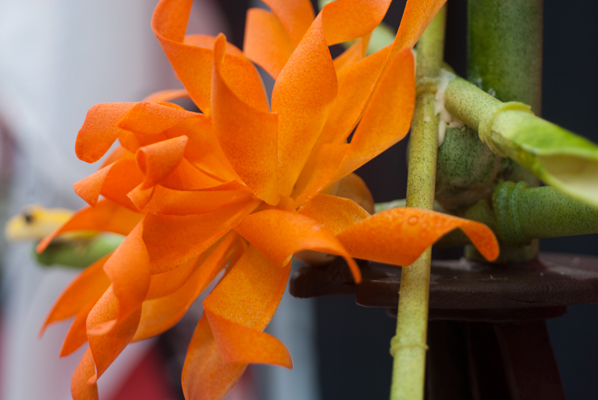 Time to go home and get back in my own kitchen to see if I too, can create some edible art.